Application Deadline: 2nd March 2018. Are you a highly motivated young Ugandan interested in policy analysis and research? Are you interested in doing high-quality research while receiving training, mentorship and further developing your professional skills? Do you want to become part of a network of promising young policy leaders? Then Youth4Policy is for you! 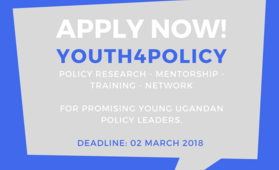 Youth4Policy is a joint initiative of the Konrad-Adenauer-Stiftung and the Centre for Development Alternatives targeting young leaders with a demonstrated motivation to shape the public policy discourse in Uganda and influence policy decision-makers. Youth4Policy Fellows will be provided with necessary training, mentorship and facilitation to undertake policy research and develop policy positions from their perspectives as youth. The programme will then support participants with a framework for communication of their ideas among policy stakeholders and decision-makers within the state, civil society, and development partners. The comprehensive program consists of multiple seminars, workshops as well as public policy dialogues over a 6 month period. Each Youth4Policy Fellow will independently carry out research on a current Ugandan policy challenge according to their interests and expertise. Fellows will then publish their research in the form of policy briefs as well as in formats such as blog articles and video clips. Each Youth4Policy Fellow will receive mentoring from a selected expert in the fields of policy analysis and research. After successfully completing their training, Youth4Policy Fellows become part of an alumni network of driven and strong young voices contributing to the public debates on Ugandan policy challenges. Promising candidates will be invited for a personal interview in March 2018. The application deadline is 02 March 2018.